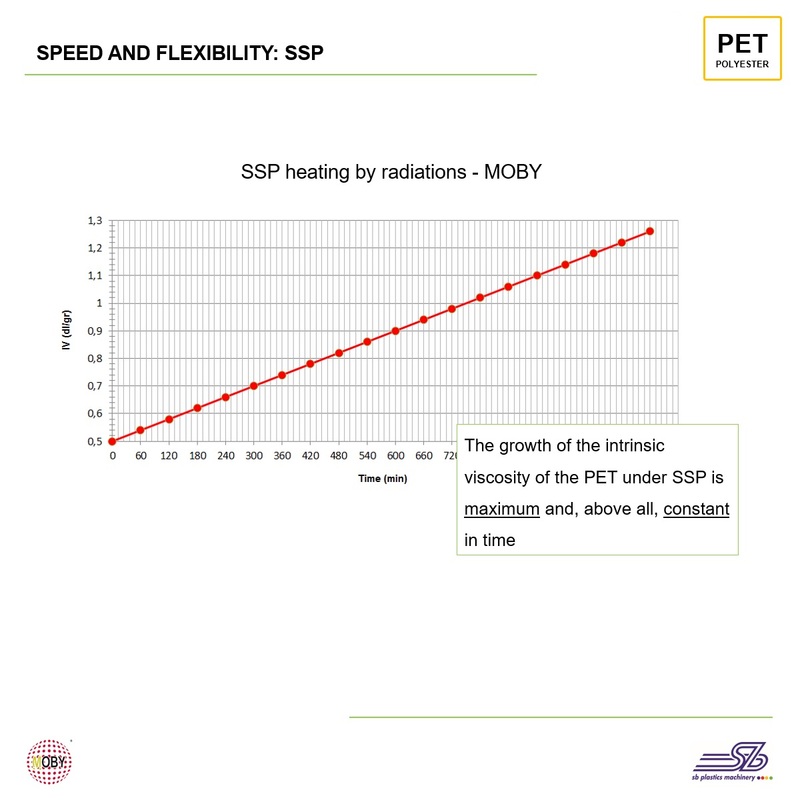 The MOBY is a patented heat treatment system for PET based on the combined action of infrared radiations, vacuum and mixing. The material inside the reactor is recirculated through a ducted screw and exposed to the action of infrared radiations in a vacuum environment. 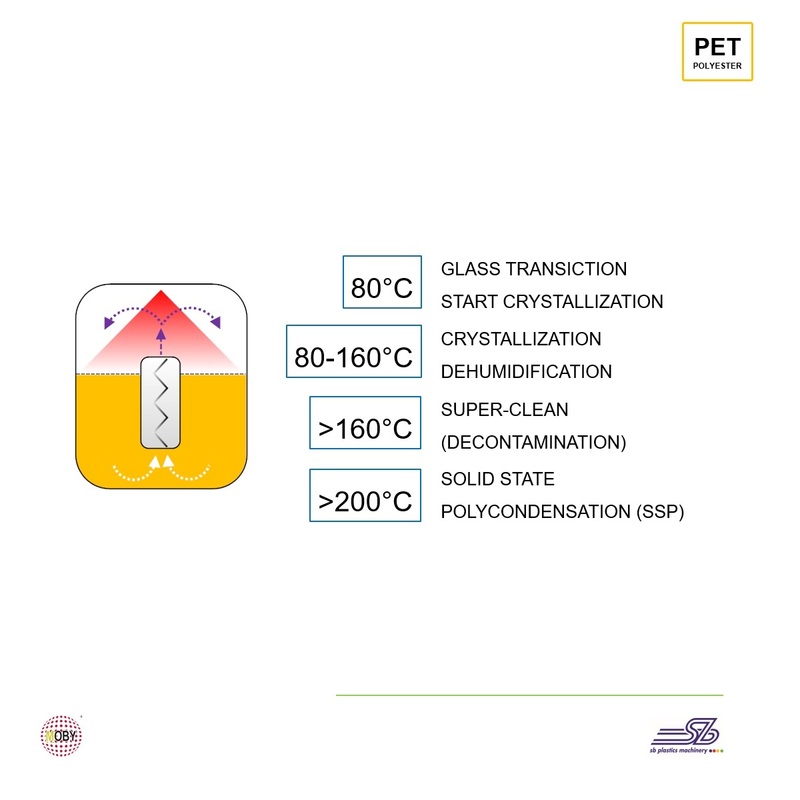 The temperature is controlled directly on the material and determines the various phases of the treatment: crystallization, dehumidification, Super-Clean (decontamination for food contact applications) and Solid State Polycondensation (rise-up of intrinsic viscosity). 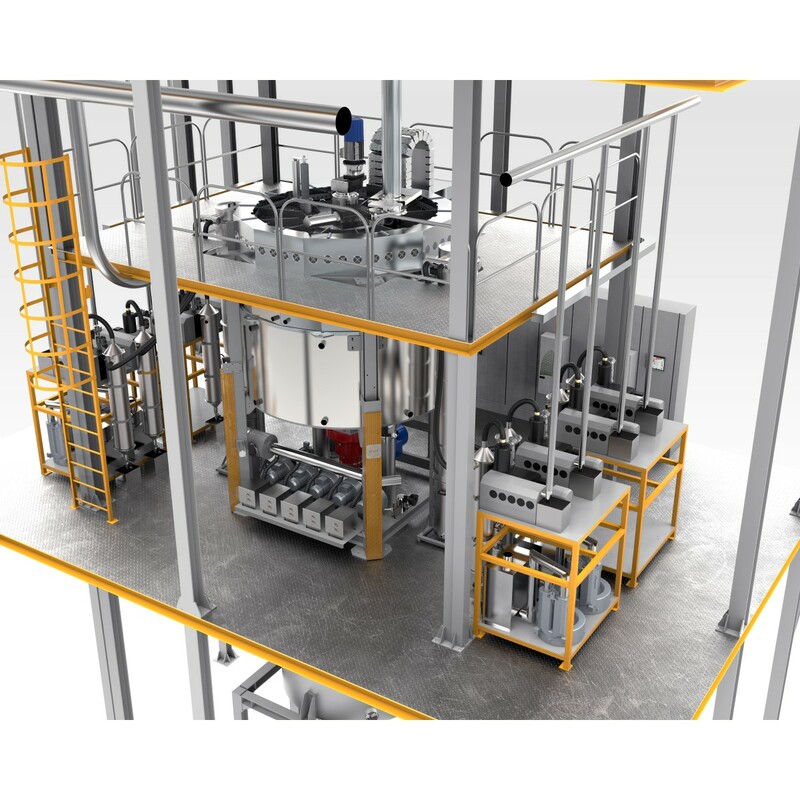 The official tests carried out by the Fraunhofer-Institut für Verfahrenstechnik und Verpackung have shown that the MOBY infrared + vacuum technology is able to decontaminate the recycled polyester (R-PET) to make it suitable for contact with food. 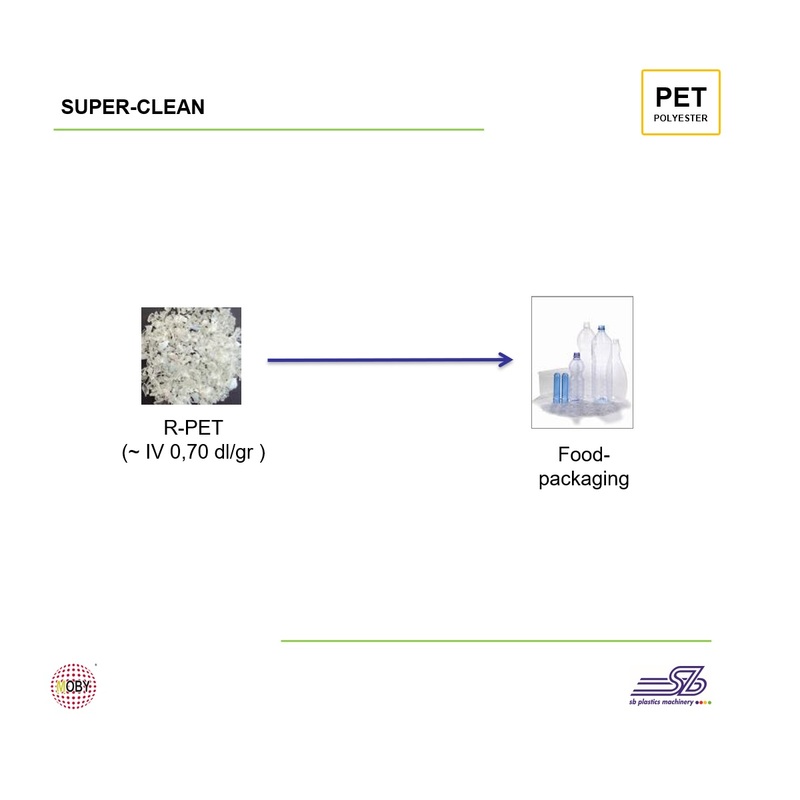 The “Cleaning efficiency” demonstrated is > than 99% on both R-PET in flakes and R-PET in granules (FDA approvals registered with NOL # 179 and # 180). The use of MOBY technology in the treatment of PET is particularly advantageous in terms of speed and flexibility, which translates into lower investment costs, reduced energy consumption and optimal R.O.I. In particular, the increase of the intrinsic viscosity has performances ranging from a minimum of 0.026 dl/gr/h up to a maximum of 0.11 dl/gr/ h depending on the shape of the material (granules or flakes) and the degree of solid contaminants (typically PVC). 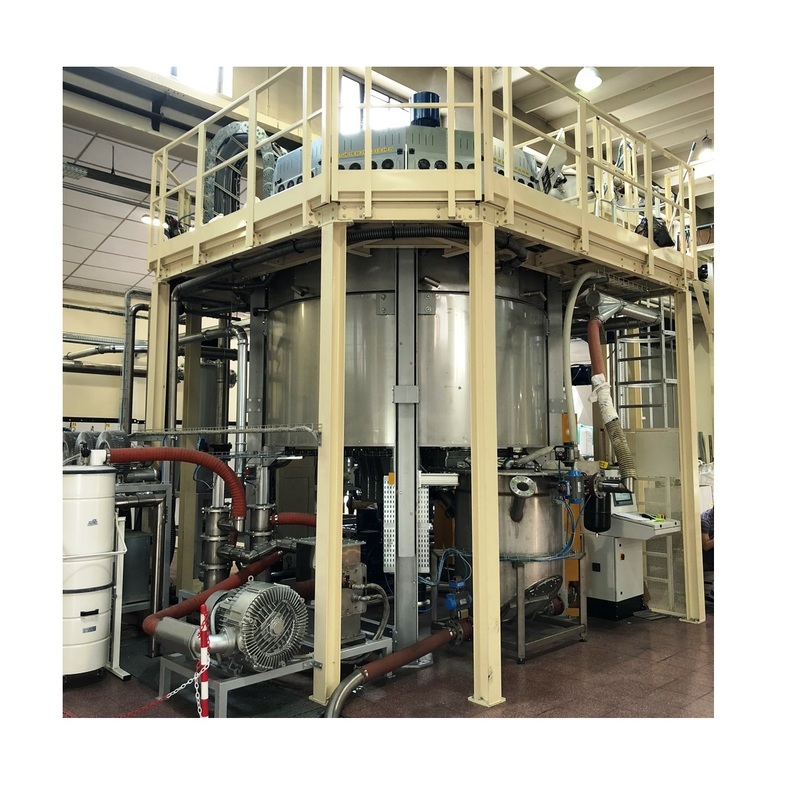 The MOBY reactor which, by combining the simultaneous action of infrared radiations and vacuum, heats PET above 200°C to perform the decontamination treatments (Super-Clean) and increase the intrinsic viscosity (Solid State Polycondensation). 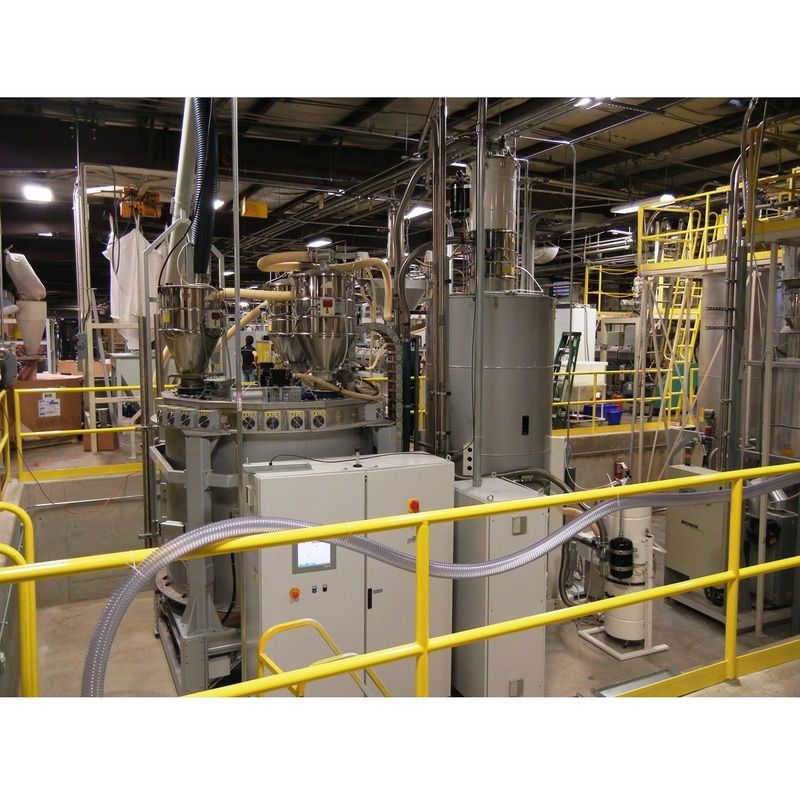 Secondary products extracted from the action of vacuum (mainly ethylene glycol and water) are condensed and collected to be disposed of. 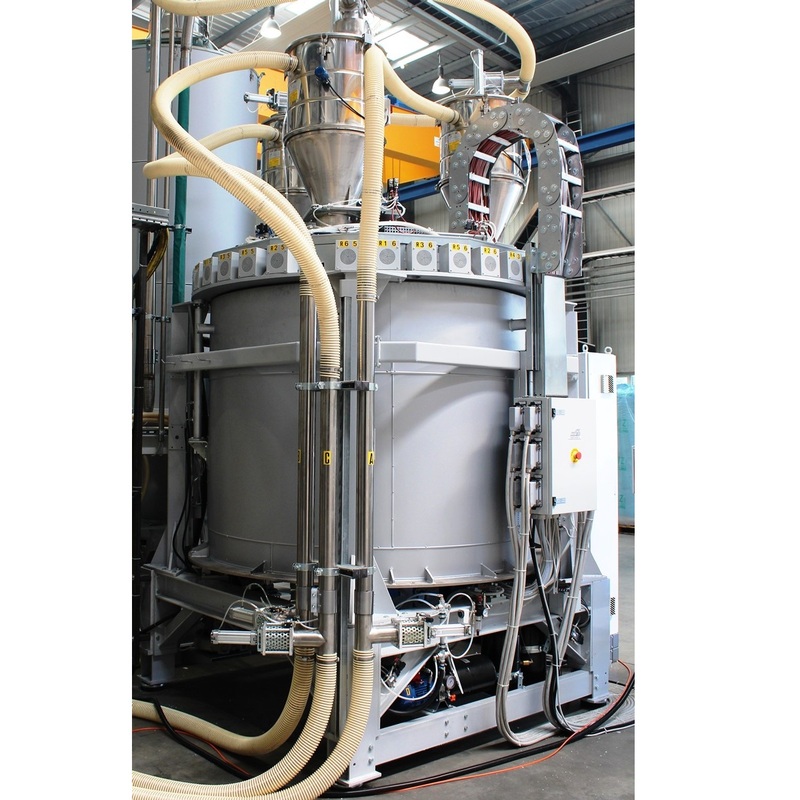 A “buffer” hopper that receives the treated PET and acts as an interface with the transforming machine (injections moulding machines, extruders or blow molders) or with a “bagging” system, allowing the whole process to work continuously. The intensity of the irradiation is modulated according to the type of material and the hourly production, maintaining a direct proportionality between efficiency and energy consumption: only the energy required is used. For example, in the case of low humid material, the temperature set-point is reached with a minimum work of the irradiation devices, while in the case of very wet material, the heating is more intense: the nature and the condition of the material therefore determine energy consumption, while the cycle time is constant. As for the intensity of the mixing, it’s also set according to whether granules, flakes, powders or ground with irregular granulometers are treated. A curiosity: the reactor is equipped with an internal conveying device that recirculates the material from the bottom upwards, creating in the upper part a typical “fountain” effect, hence the name “MOBY”. All bodies absorb or reflect a specific wavelength of infrared radiations. Since water and plastics have their own absorption / reflection spectrum, it is possible to focus the irradiation only on the water (maximum dehumidification) or only on the material (for crystallization processes or PET SSP) or on both. The result is an optimization of the energy delivered. Infrared radiations heat the material directly and evenly. The MOBY system exposes all the material to infrared radiation, ensuring a direct, controlled and uniform heating of both the part and the mass. At the end of the process, the treated material is in the same condition of temperature and humidity, which translates into immediate cycle starts and reduction of dehumidification waste to zero. The vacuum ensures maximum efficiency of infrared radiations. Compared to an irradiation in air, the yield of infrared radiations under vacuum increases up to 30%, allowing to increase the temperature of the material in less time, resulting in energy and volume savings. Moreover, without the air interference, the radiation maintains the same wavelength from the source to the material and can be exploited in all its features. The vacuum is the most effective “means” for extracting liquids. The vacuum environment causes the migration from the material not only of water, but also of any other contaminating substances (for example acetaldehyde, chloroform, benzophenone, etc …). 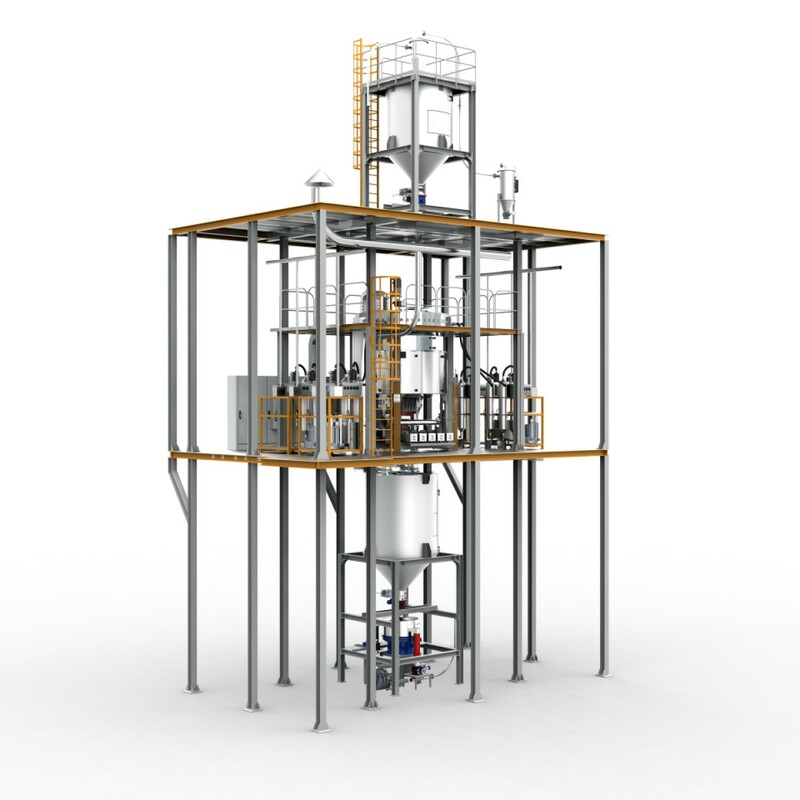 The MOBY system is thus used not only for dehumidification, but also for the so-called “super-clean” of PET in “bottle-to-bottle” processes. Vacuum is the best thermal insulation in nature. Like a Dewar vase, the reactor does not exchange any heat with the outside, from which it is not only isolated, but independent: the MOBY system can therefore operate indifferently in temperate or tropical climates with the same effectiveness. The vacuum lowers the boiling point of the water. Operating with values ​​close to absolute vacuum, the MOBY system is able to dehumidify starting from 80-85°C, thus managing to treat materials with low melting points. The vacuum prevents the action of oxidation. The material at the end of the treatment has not undergone any kind of degradation or aging and maintains the same initial quality. All bodies in the void fall with the same speed. 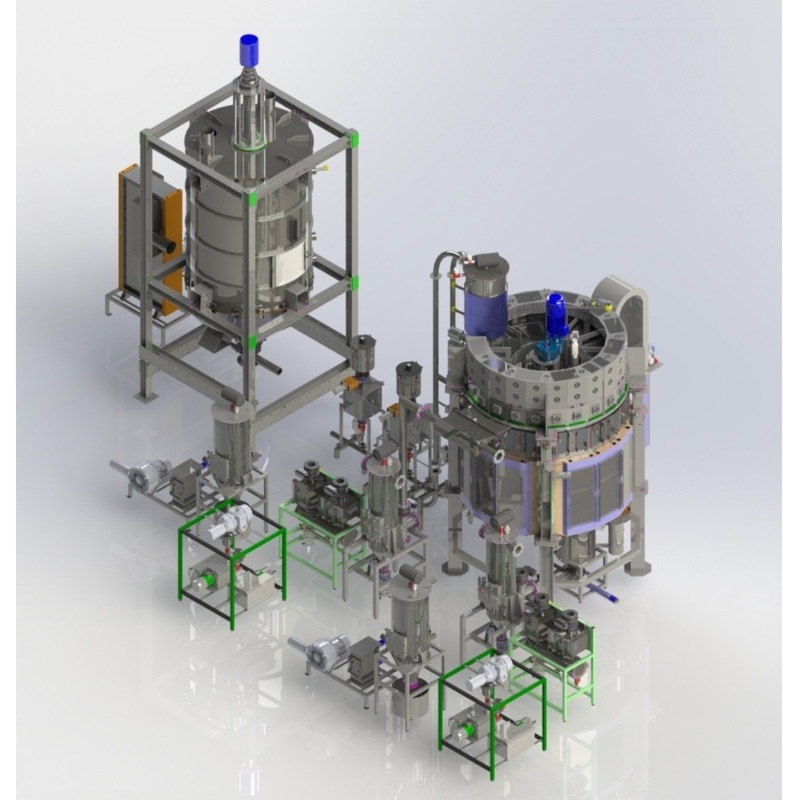 Taking advantage of a well-known law of physics, the MOBY system is able to handle not only granules, but also flakes, powders, filaments grinds, textile waste and any other type of granulometry, keeping both irradiation and filtration elements safe.